I’ve been keeping myself quite busy for the past few weeks with preparations for Artomatic, and now the show is finally upon us! Walls have been painted, lettering has been added, postcards printed, paint touched-up and, most importantly, art has been made and HUNG! Even though I completed my installation on Sunday, there is still a nagging voice in my head saying “What on Earth did I get myself in for?” and “Isn’t there more that I can do?” I can’t wait until 10pm tonight—the last minute of installation. After that, the building will be “hermetically sealed” for staff to clean and finish prepping things like lounges, bars, and classrooms. So as of 10 pm, I can’t do any more, even if I wanted to. The show opening is this Friday, May 29th—I will be there as soon as I can be after work. I’m showing two different sets of work—4 pieces of each series. The Full Moon series that I started at the beginning of the year includes Wolf Moon, Quickening Moon: Seedling Ambition, Storm Moon, and Wind Moon. I realize that I haven’t made blog posts about any but Wolf Moon; I am going to try to get them together and post this week or in the first week of the show, in case folks come here wanting to know more. The second is a series that I began over a year ago which I’m calling Water & Stones. I pieced the large quilt many moons ago as a study of patterns and lines and colors and just got stuck. I pulled it back out and quilted it just recently in time for Artomatic. The small quilts that run along side it were fun little variations on the theme. There is a fourth, but 3 is a better number for display purposes. My current description of them starts out with “if Andy Goldsworthy were a quilter…” Once again, I realize that I haven’t made a blog post about any of these. Just like with the full moon series, I am planning to post something descriptive up this week or next. 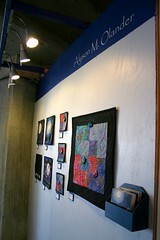 If you want to see more pictures and details of the quilts, check out my set of Artomatic pictures on flickr: http://www.flickr.com/photos/alyson_olander/sets/72157618608512307/ . 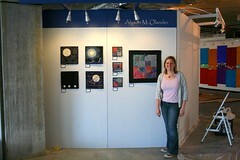 Once Artomatic opens, I will be posting (almost) all of the pieces on etsy for purchase: http://wonderlandquilts.etsy.com . Tagged 10th anniversary, Art, artomatic, batik, cotton, fabric, moon, pattern study, polyester, Quickening Moon, Quilt, Quilting, rayon, show, silk dupioni, stone, Storm Moon, water, Water & Stones, Wind Moon, Wolf Moon. Hi Alyson – you’re getting some love in an interview with Jane Broaddus (ArtOMatic) on my blog on June 12…stop by and see (Jane listed you as one of her favorites in the show). Thought you’d like to know. Tammy, thanks so much for the heads up. I will definitely check out the interview, and I’ve marked both of your work down on my AoM map so I can be sure to check out what you do!